Kotaku has learned (again) that there isn't a SingStar for the Beatles, but you will be able to play the next Beatles game — the one we knew about — like SingStar. Maybe with special mics, even. 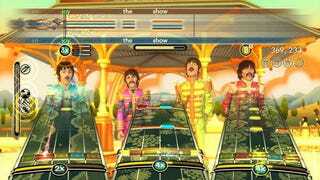 Harmonix: SingStar Beatles Is A "Misheard Rumor"
An MTV Games/Harmonix spokesperson e-mailed Kotaku a statement this morning denying the existence of the SingStar Fab Four edition, which was reported by British gaming news outlet MCV earlier this week. SingStar, for those who aren't familiar is Sony's successful karaoke game series, which has seen numerous themed editions around the world. "MTV Games and Harmonix have the exclusive rights to create music games based on The Beatles per our exclusive partnership with Apple Corps Ltd," the MTV statement began. "Contrary to the rumored reports, there is no Singstar: Beatles software product. There is only "The Beatles: Rock Band" hitting shelves worldwide on 9/9/09 on Xbox 360, PS3 and Wii in which players can play as a singing game or as a full band game." We were informed that the company is considering special microphone packs, though nothing is set in stone, the MTV rep explained: "We have been working very closely with all of our partners to create various retail promotional opportunities in Europe to support the existing installed base of existing music video game hardware with potential offerings such as 'The Beatles Microphone Bundles.' This follows on our industry leading stance on music game peripheral compatibility as we are always working to ensure cross compatibility across all Rock Band instrument controllers, as well as most Guitar Hero and other authorized third-party music video game peripherals and microphones." No SingStar: Beatles? OK. But a very SingStar-y looking package of game disc and mics bundled together featuring the Beatles? Looks like that has a shot at happening.